There are actually multiple places where you can connect a wrist strap to in order to be grounded. 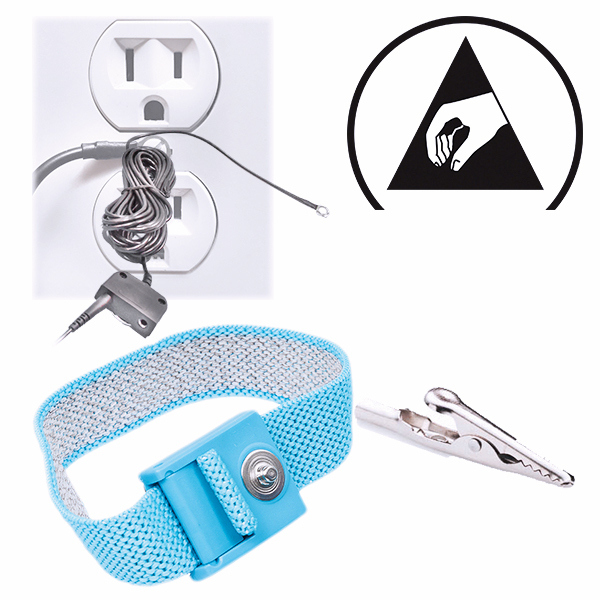 Wrist Straps can be connected to electrical outlets via cables, worn inside of knit cuff ESD garments, or clipped onto grounded free-standing grounds (like a metal table on a stone floor). ESD is based on the fact that people and things are made of electrons. When these electrons are scraped off us by contact with another object a destructive transfer of electrons (electrostatic discharge) potentially can take place. To prevent ESD we want to be aware of our surroundings. Walking across insulators like carpets and wood can cause static to cling to our skin and clothes. If we are working on a circuit board this static can then erupt off our clothes and skin onto the chips in a circuit board. When this happens, the high voltage in the ESD can puncture the semiconductors’ isolation reducing input resistance from 10’s of Megohms to 100k – if not causing a short. This is why should always wear anti static strips connected to ground. The wrist strap does two things: it provides a conductive path to ground for electrons that are static on our skins and clothes, and since it is worn on one hand (instead of two) that path is “dedicated” making it easy for electricity on the surface to find it. The inside of an anti static wrist strap is either silver-suffused nylon or metal-banded to capture static directly from your skin’s surface at a conductive rate. A 4mm stud snap protrudes from the outside surface of the strap where you will connect to a coil cord (typically good for 50,000 flexes) that has a 1 megohm resistor built into it. The resistor slow down an electrostatic discharge event (ESD) from a highly charged ungrounded surface from discharging instantaneously through the coil cord a few more milliseconds than if it were not present. Next, we want to connect the coil cord to an electrical ground so that we are not electrically isolated, but instead electrically bonded- grounded. When we are grounded static electrons discharge from our clothes and skin to the ground beneath our feet instead of onto our circuit boards. Wearing a wrist strap connected to an electrical outlet is the most common way to “ground” ourselves. We have two choices where to connect the wrist strap: we can connect it directly a grounding cable or through our ESD clothing to a grounding cable. Keep in mind that not all ESD clothing is equipped to allow a wrist strap to be worn inside it. “Hands-Free” ESD Smocks are those that have a strip of carbon fiber running on the inside of the sleeve to a snap for a wrist strap. The carbon fiber continues to the hip where the coil cord attaches. Whether we are wearing “Hands-Free” ESD garments or not, we always want to connect the coil cord to a ground. This can either be a grounding cable or (by sliding the alligator clip over the end of the coil cord’s plug so that we can clip ourselves to it) a grounded structure (i.e. a metal table standing on a stone floor). If you use a grounding cable to attach yourself to the electrical outlet found inside your building instead of using the alligator clip you have multiple choices. However, they are all built with a 1 megohm (1 x 10e6 ohms) resistor inside of them so that electrostatic energy will discharge through them at a dissipative rate (not conductive). A wrist strap ground grounds the wrist strap separate from anything else. If you feel you need to separate your work surface from the wearer of the wrist strap this a good choice. On the other hand, a common point ground can be used to ground both an anti static mat and wrist strap together. You could also choose to use a continuous monitor to make sure both the wrist strap and mat are grounded. Whichever cable you use it will have a ground cable attached to it that ends in an “eyelet”. This eyelet is a metal ring that you can screw into the nearest electrical outlet to transfer static from the ground to the ground line in your building. Unless you have to, it’s recommended not to use the alligator clip. While it seems convenient, it is best used only when you are sure of the pathway to ground you are attaching it to.